Big convoy of wounded arrived towards late afternoon – travelled nearly 2000 miles from Tunisia. Weather rather warm and day becoming rather monotonous. Several games of housey then retired until midnight before going on guard. Arose this morning for breakfast – becoming rather warm being in bed. During afternoon walked to Suez Canal – nearly five miles away but doesn’t look the distance. Great rumours getting in circulation coming from the wounded – all think we will be soon returning home – everybody praying that it is correct. Rumours circulating that Meaty* is coming in – if correct most certainly do my best to see him. Weather rather warm – believe we will be changing to shorts on Monday. Blew up a storm during late afternoon. 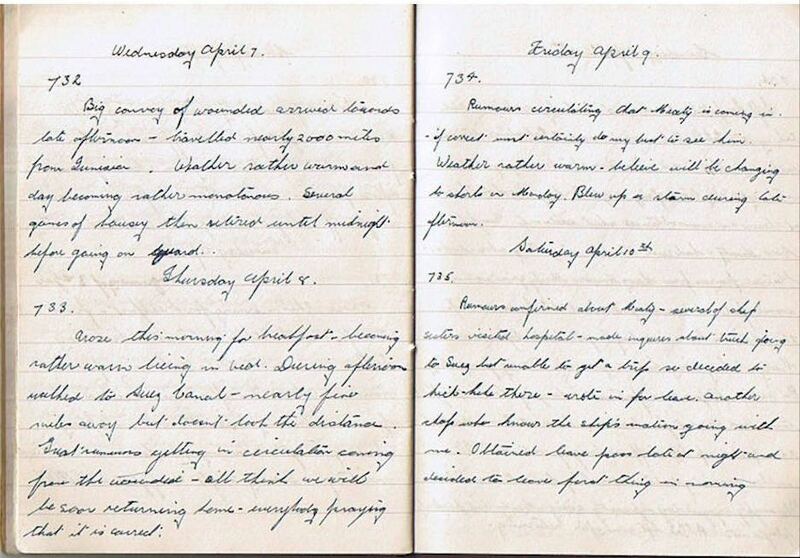 Rumours confirmed about Meaty – several ship sisters visited hospital – made inquires about truck going to Suez but unable to get a trip so decided to hitch-hike there – wrote in for leave. Another chap who knows the ship’s matron going with me. Obtained leave pass late at night and decided to leave first thing in morning. * Meaty – I believe “Meaty” refers to Captain Garnet(t) Meatyard. Although I have found no reference of him being the captain of the NZHS Maunganui at the time, he was referenced in this article about the TEV Wahine. With my grandfather having been raised in the port town of Lyttelton and his father having been captain of a ship, its very likely Captain Meatyard was an old friend and was likely a senior officer on the ship at the time. Wow these are incredible historical records!